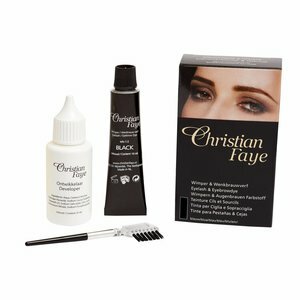 Christian Faye Eyelash and Eyebrow dye sets consist of Paint, Developer, brush, eye protection and gloves paper.Holds up to 6 weeks. Available in 3 colours, Brown, Blue and Black. Christian Faye Eyelash and Eyebrow dye sets are ideal for long-term colour of your eyelashes and / or eyebrows. Holds up to 6 weeks. Available in 3 colours, Brown, Blue and Black. Sets consist of Paint, Developer, brush, eye protection and gloves paper. First test on the arm of the skin for you to shown no allergic reaction. With the proper application safe to use. Read the detailed description of the product before use.